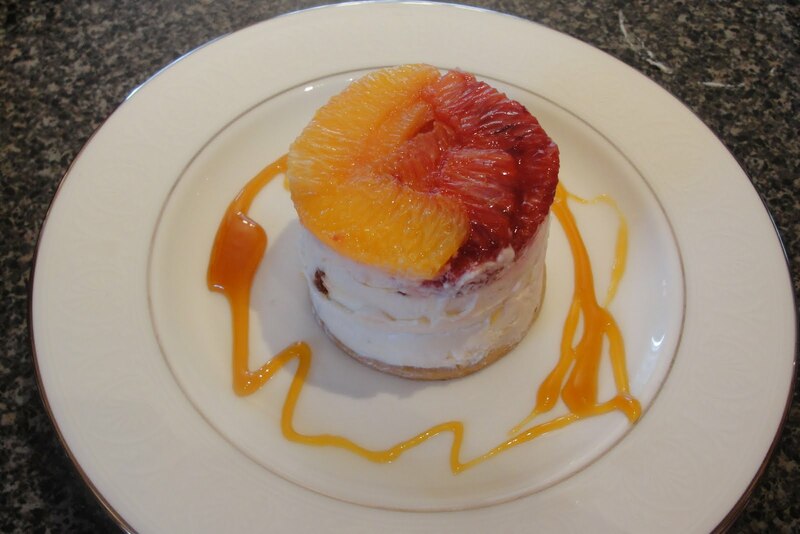 March Daring Bakers – Orange Tian | eat. play. sleep. Oh my goodness. This was a FUN challenge. There were a lot of components, and I’d made them all before, but never assembled them like this. And the sauce…oh man, it’s so freaking good. 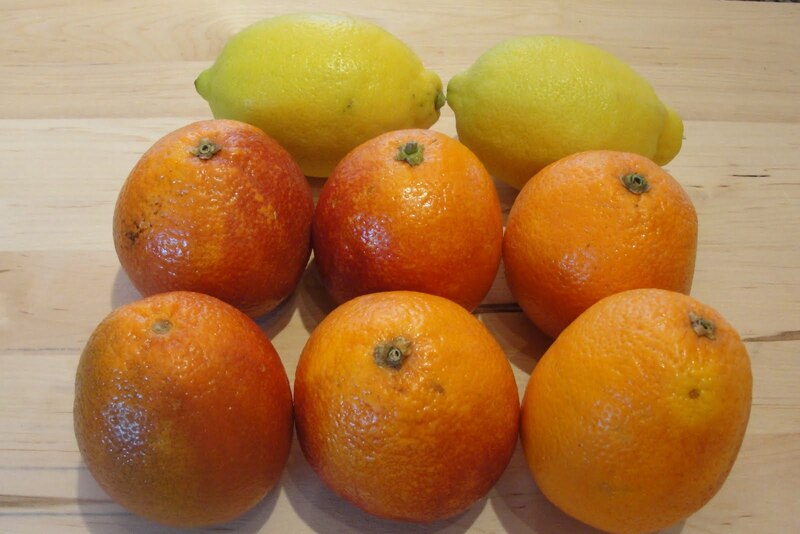 The first step in this challenge was making marmalade. I chose a blood orange marmalade spiced with star anise, cardamom, cinnamon, and ginger. I’m sorry to say that I didn’t take very many pictures of the process…but basically, you chop up some orange and lemon peel, soak them in water for 24 hours, then boil them with sugar and spices. The result is yummy. Of course, I made sure to read the girls Paddington Bear while we had our snack of marmalade on homemade bread! I made the marmalade about a week before the rest of the dessert, and I’m glad I did. There are a lot of components (hence the challenging part! ), so I sent Joel and the girls off to OMSI for the morning and started cooking everything else. First came the pate sablee. This is a basic pate brisee, but it’s got two egg yolks and some baking powder. The resulting cookie is more like an English tea biscuit. The next time I make this dessert (and I most definitely will), I’ll use a genoise or other sponge cake for the base, as this didn’t really go with the rest of the delicate dish. 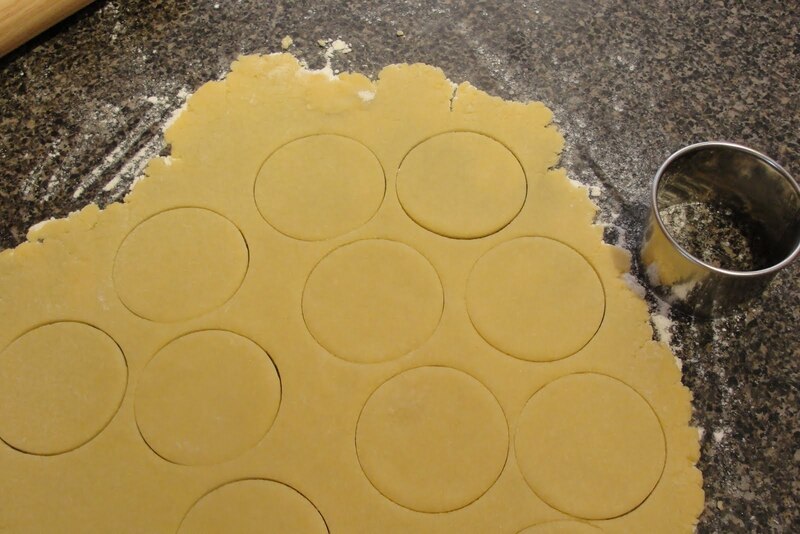 I only made 6 tians, and cut the rest of the dough into circles (thanks, Mom, for lending me the round molds! 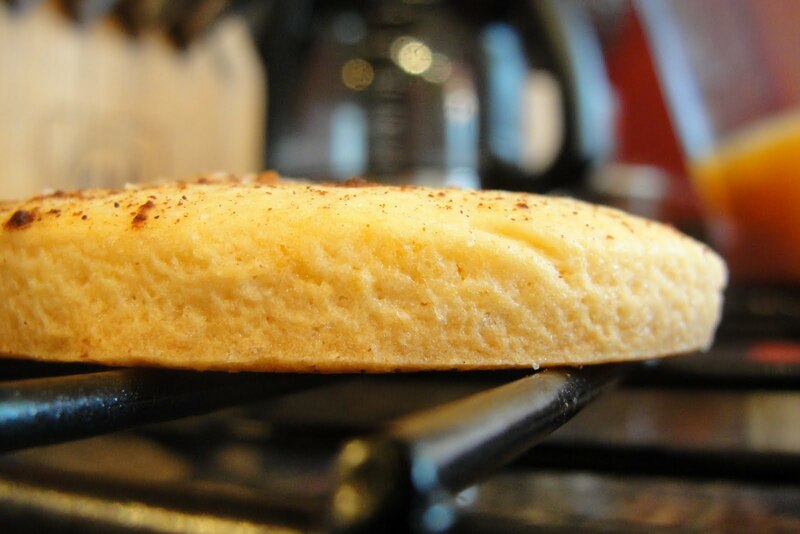 ), brushed them with cream, sprinkled them with cinnamon and sugar, and the we used them for dipping into our tea. While the biscuits were baking, I supremed the oranges. 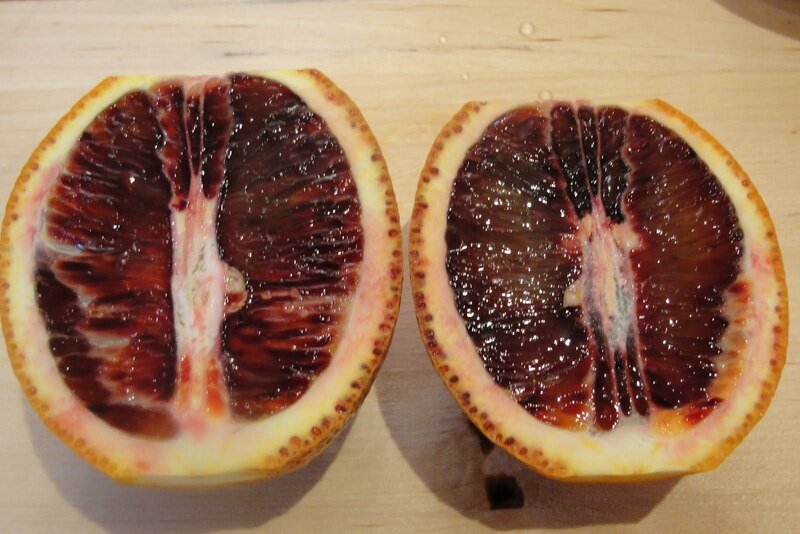 I had a few blood oranges left over from the marmalade and a few navels, so I just used them all. If you don’t know how to supreme an orange, here’s a great how to video. While the segments were draining on a tea towel, I made the stabilized whipped cream. This sounds a lot more complicated than it is. To stabilize, you simply add some unflavored gelatin. Easy peasy. 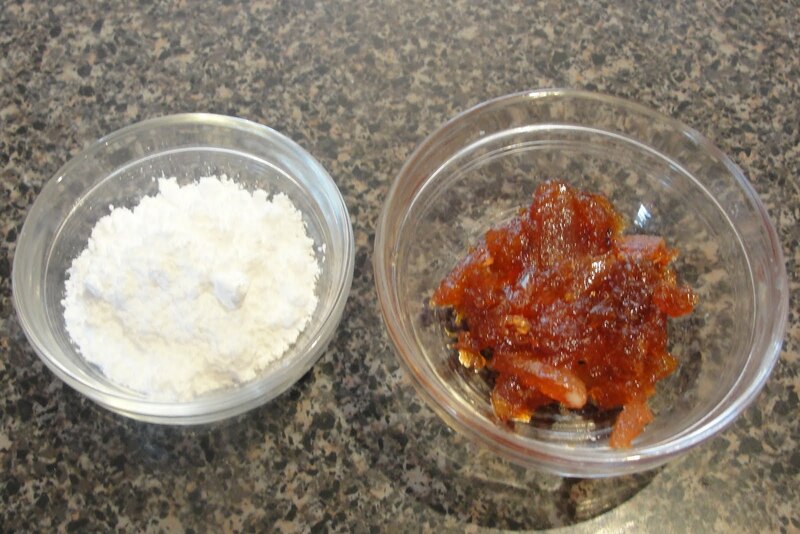 I also added some sugar and then folded in some of my blood orange marmalade. Then (and now I can kick myself for not taking pictures!! ), I assembled the tians. I used the high ring molds, placed a layer or orange segments, then some of the whipped cream, then a layer of marmalade, then a biscuit. I put them all on a cookie sheet and let them set in the freezer for a bit. While they were setting, I made the sauce (which, in my opinion was the best part!). Caramel sauce is one of those simple things, but it’s also pretty easy to mess up. The key is that you really shouldn’t have any distractions while you’re cooking it. It only takes about 2 minutes and it needs your full attention. 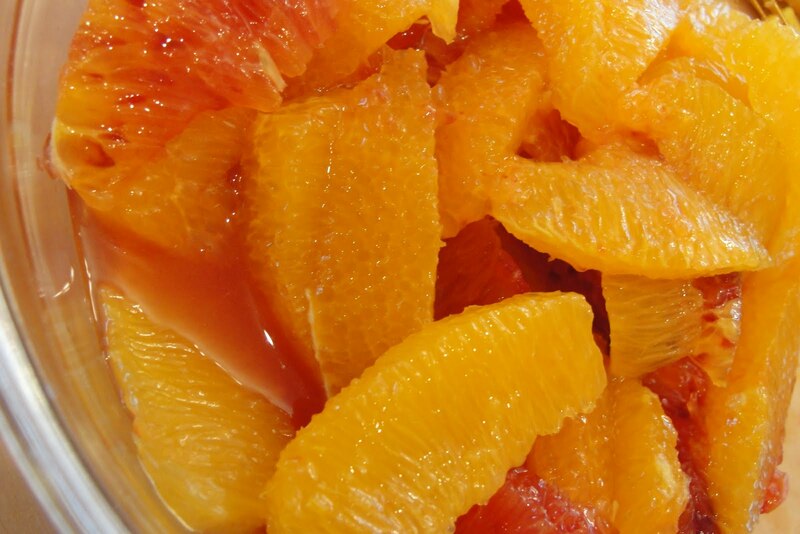 This recipe called for an orange caramel sauce…heaven! 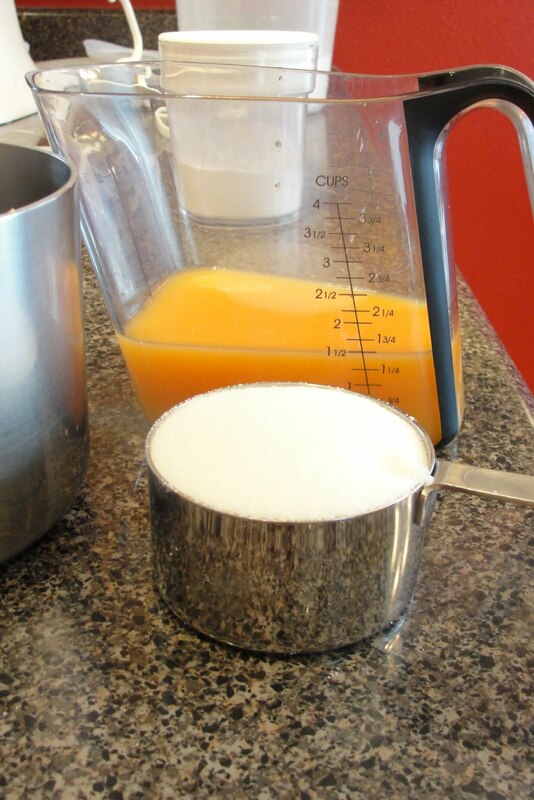 There are only two ingredients: orange juice and sugar. 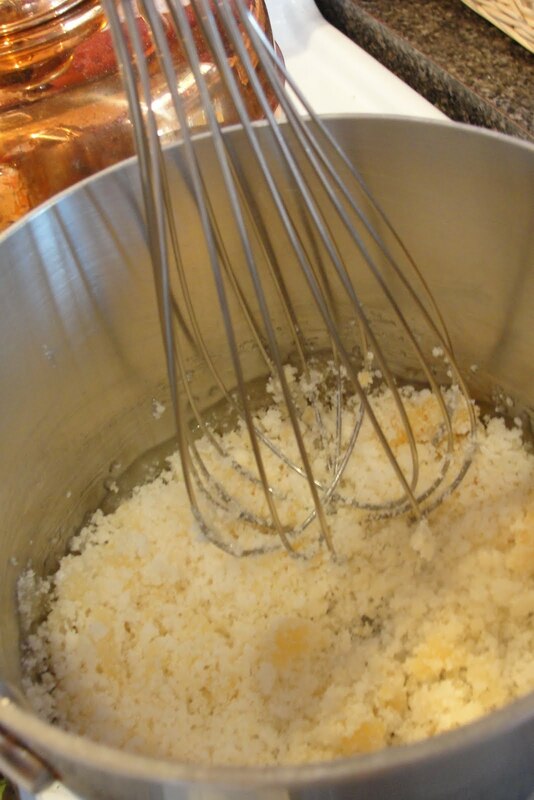 First, you cook the sugar over medium heat until it starts to melt. It’s best if you stir it a bit. You’ll see it clump and then start to caramelize. 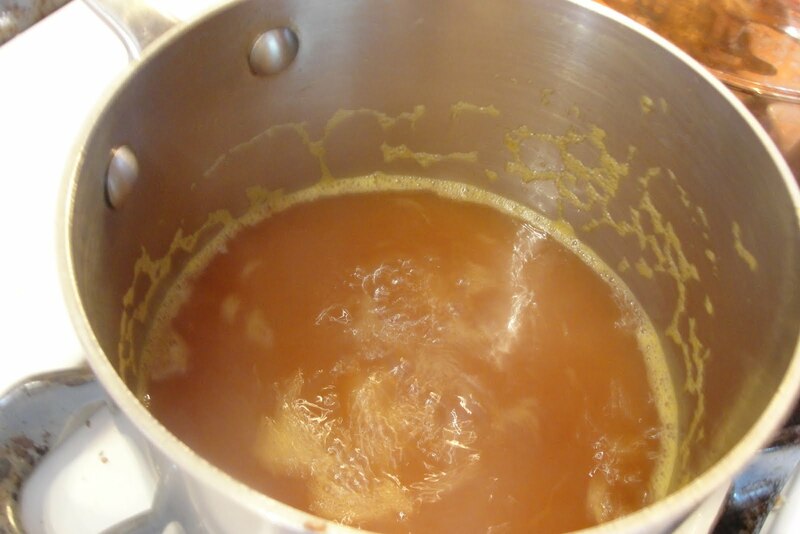 Then you add your orange juice…the mixture will bubble up quite a bit, so it’s best to use a big pot. Then I just let it simmer until it thickened up. Then I tried really, really hard not to pour the entire pot into my mouth. It was that good. Ava decided that since I was making a fancy dessert, we should have a fancy tea party. Since my mom had lent me the ring molds, I invited she and my aunt over. 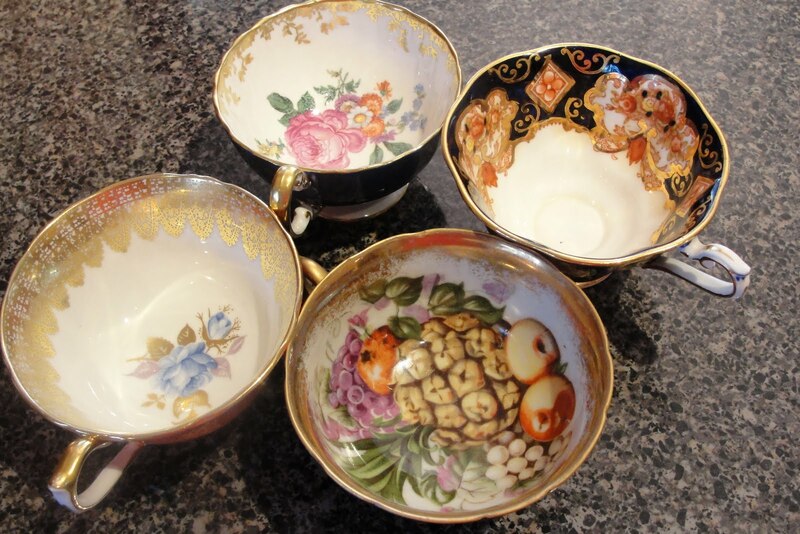 My mom brought some of her vintage tea cups and saucers…aren’t they pretty? Here’s the finished tian, complete with caramel sauce. YUM. YUM. Your tian looks fantastic, and I agree about the caramel sauce! Yum! My favourite part was the citrus segments in the unreduced sauce–I kept eating them and barely had enough left to put the tian together. what a great collection of saucers! your tian looks fantastic, i'm not suprised your family enjoyed eating them! 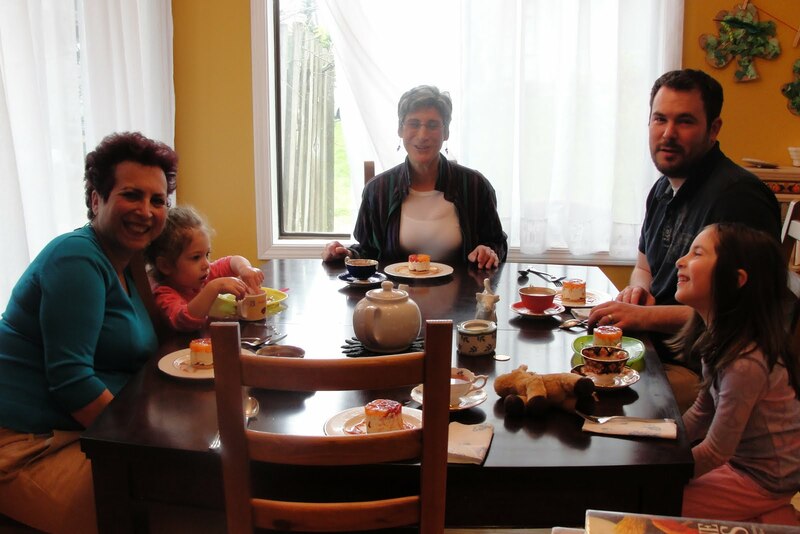 Wow – your finished tian looked beautiful, and those cups are awesome! What a perfect tea party! Aw, the tea party looks so sweet! I love the sound of your spiced marmalade, yum!